Chiang Mai Inthanon Golf Course is a 2009 built Golf Course about 40 minutes south of Chiang Mai. Surrounded by fruit orchards set amidst Doi Inthanon Mountain (Thailands Tallest Peak) it’s a beautiful natural setting and features fantastic golf course and mountain views. 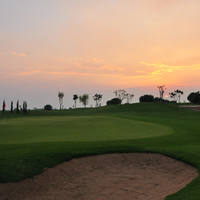 The course difficulty varies with some challenging holes and some more basic holes, there is water on 12 of the 18 holes, the elevation change is quite frequent and the 17th & 18th holes are considered two of the very best in Chiang Mai. The contemporary club house boasts excellent food, very cold beer and panoramic views of the picturesque surrounding countryside. The course itself has a natural feel and the clean mountain air is quite refreshing.